At the 2017 Screen Actors Guild Awards, Octavia Spencer took the stage with fellow actors from the movie "Hidden Figures" to receive an award for Outstanding Performance by a cast in a Motion Picture. She was dressed in an elegant black gown designed by Tadashi Shoji. Her look was flawless but the stunning creation that caught my eye was her killer turquoise drop earrings. I couldn't find out who designed them but they undoubtedly were expensive. The earrings I saw on TV for only a minute, were the inspiration for this completely affordable project which incorporates similar design elements. Don't bother to check - they are not identical to Octavia's costly version. 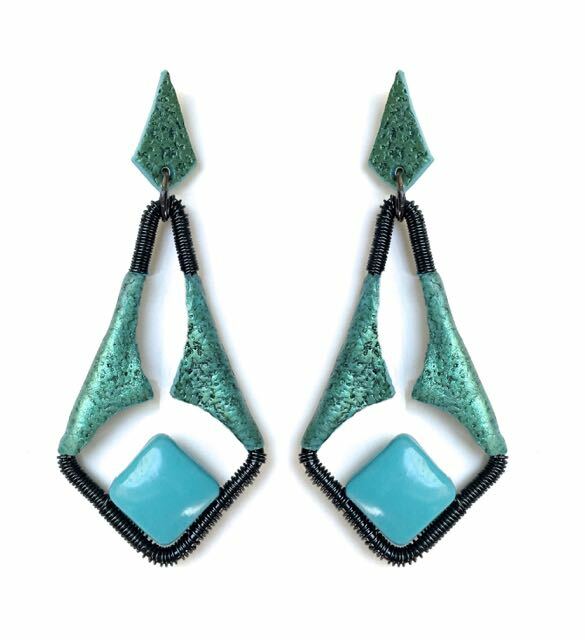 Here simple elements like clay and wire combine with mica powder for that pearlized blue/green sparkle. The turquoise pillow bead is easy to make and adds focal interest to the complete design. Make a pair for yourself and you'll know how to answer when someone asks, 'Who are you wearing?" step 1 - Download and print out the templates (at the top of the page) onto card stock. Roll out clay on the second to the thickest setting on the conditioning machine. Cover the clay with deli film and cut two .75” squares from the clay. step 3 - Place one square on top of a .50” cutter with the sharp side up. Use your knuckle to gently form a dip in the center. step 4 - Cover the clay with the second flat .75” square. step 5 - Flip the cutter and clay over and press down to join and cut the two layers together. Air is trapped between the clay pieces to form the pillow effect. step 6 - Use a sculpting tool to nudge the corners loose. One free, blow hard into the cutter to expel the bead. step 7 - Push a fine sewing needle through the bead diagonally. Bake the bead at 275 degrees for 30 minutes. Press sandpaper or other similar texture onto a piece of turquoise clay. step 9 - Cover the clay with black acrylic paint. Press lightly with the brush so as not to flatten the clay texture. step 10 - With a soft damp cloth, gently wipe away the surface paint, resulting in black textured details. Allow the paint and clay to dry. step 11 - With a soft sponge applicator or paint brush, brush green mica powder across the surface. With a craft knife, cut the earring shapes out of the card stock template creating a stencil. Lay the stencils on the textured clay and follow the shape with a craft knife to cut the pieces. 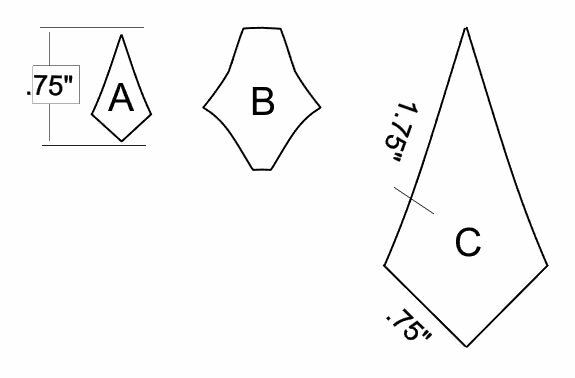 Cut two “A” shapes and four “B” shapes. Set the pieces aside. Cut two pieces of the 12 gauge wire to measure five inches. Starting at the opening in the fame outline, form the frame shape by following the template shape. step 14 - Bend the wire over flat nose pliers where required to complete the frame. Press a scrap piece of wire against the backside of the “B” pieces but don’t press through the clay. step 16 - Remove the clay and place it on the earring frame. Fold it over the wire and press the clay edges together. step 18 - Bake the frames in a 275 degree oven for 30 minutes. Allow the clay to cool completely before handling. Starting at the bottom edge of the clay on the frame, wrap a 30” piece of the 26 gauge wire around the frame working to the other clay piece. Cut away excess and smooth the ends. step 20 - Wrap a 15” length of wire around the top edges of the clay working from one clay piece to the other. step 21 - Buff the pillow bead to a gloss. Slip a piece of 26 gauge wire through the bead. step 22 - Position the bead at the bottom center of the frame and fit the wires between the existing wires. Wrap around the frame twice. Cut off excess and smooth the edges. Apply a coat of Sculpey Gloss Glaze to the Mica Powder pieces to protect the finish. Allow the glaze to dry. step 24 - Open and slip a 7mm jump ring into the hole in the “A” pieces and around the top center of the earring frame. Close the ring. step 25 - Glue an earring post to the back of the “A” pieces with E6000 adhesive.